Casey at the Bat is a very contemporary interpretation of the classic Ernest L. Thayer poem originally published in 1888. 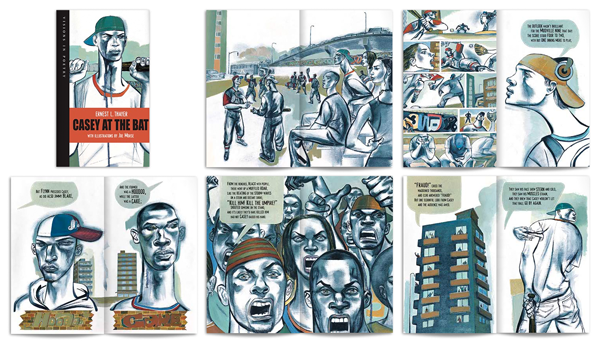 Illustrator Joe Morse sets the poem on gritty urban streets with a multiracial cast of characters with the prose housed in comic-like speech bubbles. Joe brings the style of his visceral oil paintings, (frequently seen in the pages of Rolling Stone magazine) to play out the story of a proud and mighty slugger. He powerfully captures the tension of the fans, ump, and the players—and takes you on an exciting ride all the way to the ultimate ‘strike 3’. You can almost smell the hot dogs!